Its arrival was long awaited, it had a glittering premiere on Friday April 22, 2011, at the Silverbird Galleria in Lagos and now in its third week at the cinemas, ‘Ghetto Dreamz’ has not disappointed the general expectations that it will succeed at the cinema. Free memorabilia of Dagrin like Handkerchiefs, Tshirts and Caps were distributed to the first 100 people to buy the 'Ghetto Dreamz' movie ticket in each of the cinemas across the country, but long after the gifts were exhausted, movie lovers in and out of Lagos have not stopped garnering 'Ghetto Dreamz' with accolades, reflected in packed full cinema hall every time the movie is shown. Put together by Stingomania Records, 'Ghetto Dreamz' is a way of ensuring that the life, works and ideals of the late award-winning popular rapper, Dagrin is sustained for future generations to learn from. 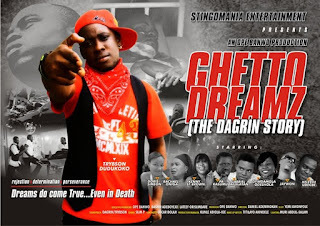 Directed by Daniel Adenimokan 'Ghetto Dreamz' tells the story of the late rap artiste DAGRIN. The biopic chronicles the life and times of Dagrin and features the early life of the rapper, his rise to fame and circumstances that surrounded his death. 'Ghetto Dreamz' features Trybson the Stingomania’s hip hop sensation as Dagrin and other nollywood stars like Doris Simeon, Rachel Oniga, Pa Kasumu, Kenny Saint brown, Jaywon and a fast rising Oyindamola Odesola and others. Speaking on the success of the movie so far in the cinemas, Stingomania led Ope Banwo, the producer of the movie said ‘Dagrin was loved by everyone, young and old and all of Dagrin’s fans were open to 'Ghetto Dreamz' because it shows them more than they think they know about the late rap artiste. The touching yet exciting looks that people wear after seeing Ghetto Dreamz gives us a sense of fulfilment as an organisation’.